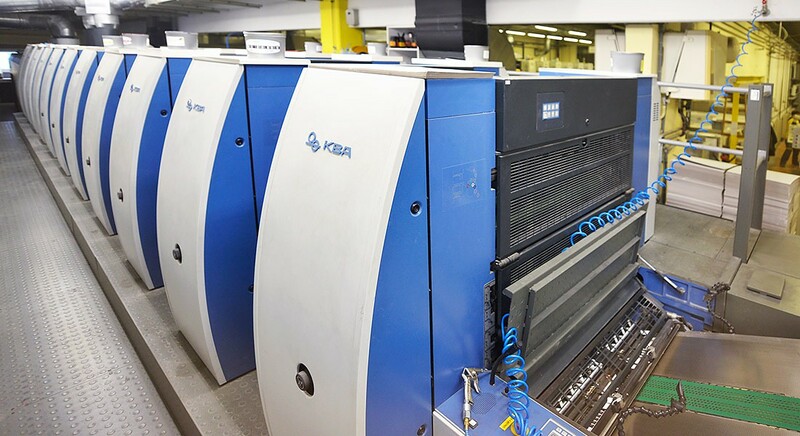 Enhancing our competitiveness on the market and providing us with the ability to deliver constant printing quality and fast responsiveness to our customers, our new 7-color KBA offset-press with 2 coating units has been doing the job since it´s first commissioning. We´ve been selecting a new B1-format printing press already since the middle of 2015. In the end of 2015 we decided to buy a new machine, because the technical advantages by far outweighed the savings when buying a pre-owned press. Testing and selection of the right model alone took us more than three months. We visited several suppliers for printing presses, but in the end we decided for KBA. The order was placed on 23.03.2016. The installation of the machine began on Monday, 29.08.2016, when the first of alltogether 5 trucks arrived in Medvode, with the last part of the press shipped in week 35. The training of the first two pressmen took place from 29.08. until 02.09.2016, and the training of the maintenance team from 12.09. until 16.09.2016. The acceptance report was signed on 04.10.2016. Beginning with this date, we startet routine printing in 3 shifts on the new press.